Editor's Note, April 19, 2015. It is now almost two years since I wrote and posted this review. Since then I have walked, cycled and driven past the plaza at least once a week, and often more. I have yet to see anybody use the plaza for more than a walk by. Today was a beautiful early spring day and I thought for sure there would be lots of people on the plaza. I was wrong. I hung around for about 30 minutes and I saw one couple walk through and one guy on a bike use the seating area as a bit of an obstacle course for about a one minute. Earlier in the day I was told by some skateboarders (who had travelled from Edmonton just to skate various sites in our downtown) at the MacDougall Centre that Poppy Plaza would make a great boutique skatepark. It seems a shame the City spend millions of dollars to create this public space and nobody uses it. Maybe we should take down the signs and let whomever want to use the space do so -rather than just let is sit their empty. I can't help but wonder "What were the lesson learned?" View of Poppy Plaza at 2:30 pm on Sunday, April 19, 2015. Recently Poppy Plaza opened along Memorial Drive at the Louise Bridge (10th Street). The Plaza is part of a rejuvenation of Memorial Drive as Calgary's ceremonial boulevard that celebrates Canada's and Calgary's contribution to the First and Second World Wars, as well as other war and peace keeping efforts. The first phase of Memorial Drive took place in the 1920s when trees were planted along the roadway in memory of fallen soldiers. Today they have become a valued part of Calgary's urban forrest, but they are also nearing the end of their life expectancy. Over the past five years several projects have been initiated that will make Memorial Drive an important part of Calgary's heritage for another 100 years. The first project was the redesign of the roadway with a boulevard in the middle with decorative lighting, banners and plantings (including poppies). Poppy Plaza has already been the subject of graffiti and complaints that skateboarders have taken a liking to the design and are causing damage, which in turn is causing some officials to want to fine the skateboarders. However, I liked Ray Hillman's May 8th letter to the editor in the Calgary Herald who was in favour of letting the kids play. Hillman recalls a cartoon from the Calgary Herald published at Remembrance Day showing a WWII soldier lying on a cloud looking down at a group of children and the caption read, "I just love watching them play." He then goes on to say that many of these skateboarders are probably the same age as the soldiers who fought for our freedom. I look at the design and think "how could the designers not think that the skateboarders would love this?" Yes there is a skateboard park just across the river, but everyone knows skateboarders are part of any city's street culture and love to use public spaces everywhere, not just in the designated areas, which get boring pretty quickly. They are free spirits and you have to take your hat off to them as they are out there in all kinds of weather practicing their tricks. If you want to animate a public space, make sure you make provisions for skateboarding and you are sure to get year-round animation. Personally, I find the skateboarders fun to watch. I have visited Poppy Plaza several times and the place is deserted even on nice days. Seems to me the designers Marc Boutin Architectural Collaborative should have known that skateboarders would use the plaza and made allowances for that. Good public space design has a diversity of uses which in turn creates a diversity of users resulting in the animation of the space. Poppy Plaza should have been designed for multi-uses - memorial, picnics, skateboarding and maybe even a soap box so people could rant about their political views. 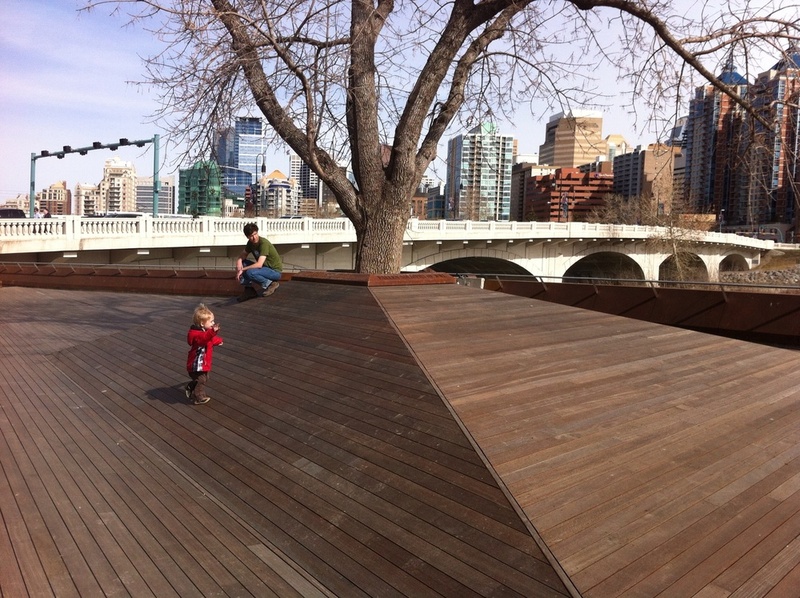 We need to think about including as many uses as possible for public spaces - design them for people of all ages and backgrounds - that is what public place-making is all about. One of the key elements of the plaza are these life-size letters spelling out Memorial. Made out of what looks like rusty steel, they are place right up against the sidewalk and very visible to the road. There very foreboding. Unfortunately it is very easy to carve into the rust to write messages or tag them. Skateboarders getting ready to do their thing. I have yet to see anyone sit on these seats which look intriguing but not inviting. They look like something from a skate park. One of two larger steel sculptures on either side of 10th street they have the look of a bomb or torpedo. On them is written words from the poem Flanders Fields which includes the phase "where poppies blow." The rusted steel gives an immediate patina which in turn gives the plaza a historical sense of place. The steel looks old and weathered. It has the feeling of a crying wall. The plaza even has a ramp that allows the skateboarders a place to launch off of. As well it serves as a great place to sit and people watch or watch the skateboarders or BMX bikers do their tricks. A good example of a simple design that functions in several ways. Kids will also love running up and down the ramp. It is a cleaver design that allows for multiple uses for people of all ages and backgrounds. It also offer great views of the Louise Bridge and downtown skyline. A view of Downtown from Poppy Plaza and the elegant Louise Bridge. 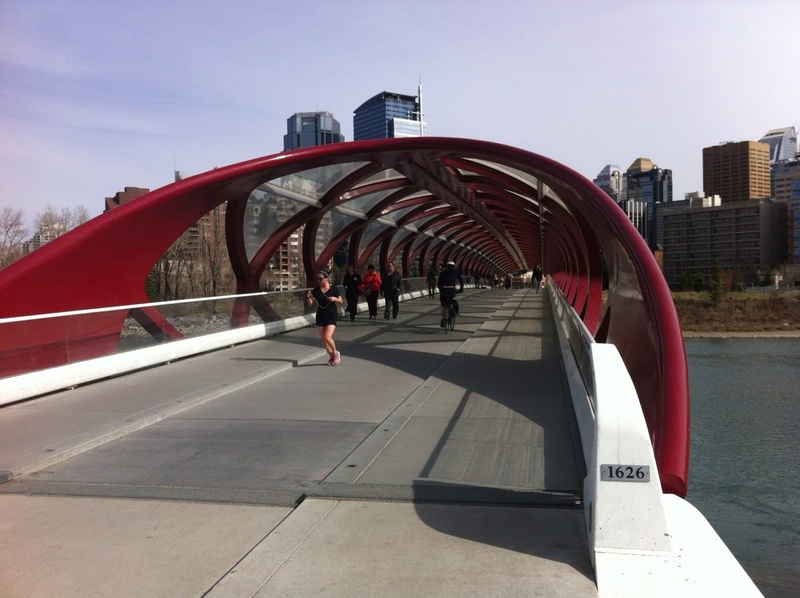 The Peace Bridge is popular with downtown workers morning, noon and night - be it walkers, runners or bikers. The west side memorial which is much more subtle and solemn with the white marble panels with the names of soldiers from various wars and peace keeping efforts. 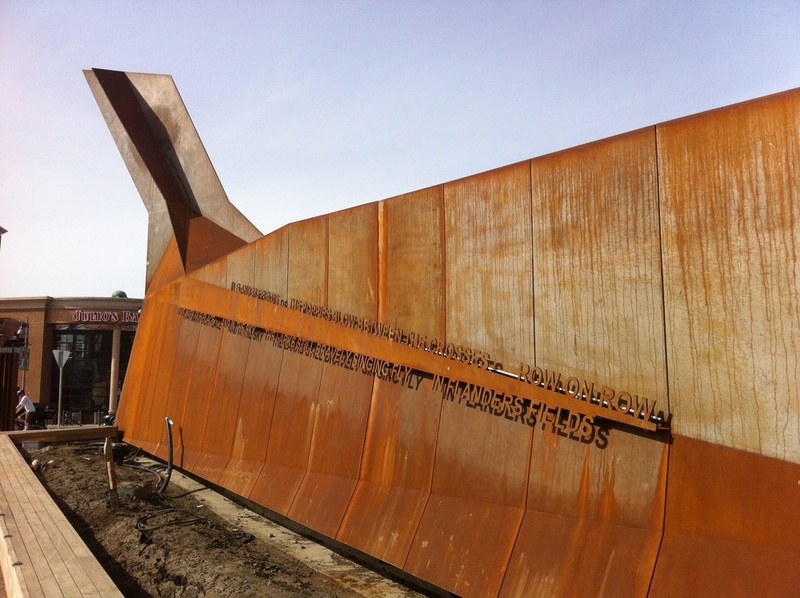 There are elements of Poppy Plaza in the west side memorial with the rusted steel. From a distance it looks like one of the small boats that were use to land soldiers on the beach of Normandy. Remembrance Day crosses on the Memorial Drive lawn.